A special note about this week's Brief Bio. It is a guest post from my good friend Pete Shearer. Pete runs a tech blog called Pete on Software, and also has a podcast, The Pete on Software Podcast. I have made some minor edits to his post, but otherwise it's completely his own work, and all the credit goes to him. Pete's official bio: Pete has spent his career as a technologist working on projects large and small for organizations of all sizes. He has a passion for technology and more specifically, for finding the right technology solutions to fit the needs of his clients. Currently, he is trying to do as much in the mobile and cloud space as possible because it's the future and because it's fun! If YOU would like to do a Brief Bio guest post (or any other guest post), I'm always open to it, and I even have a list of names to suggest for you. It's a great way to learn a little history. John William Mauchly was born on August 30, 1907 in Cincinnati, Ohio (O-H!). His father, Sebastian, was a high school science teacher. When John was 8 years old, his father received an appointment in Washington, D.C. to become chief physicist at the Carnegie Institute. Due to the salary that his father's position afforded him, John was able to get a very good education. He put that education to good use and had quite the aptitude in electrical wiring and construction. While he was still in school, he earned money by replacing mechanical doorbells with electrical versions for people. And when his neighbors had household wiring issues, who did they call? That's right, our Johnny boy. John breezed through high school and ultimately enrolled in Johns Hopkins University in 1925 to study in their Electrical Engineering program. Like all great minds, he was soon bored and at the end of his Sophomore year, he felt like engineering was too boring. Fortunately, Hopkins had the ability for great students to enroll in a Ph.D. program before their undergraduate degree was completed (what?!?) and in 1927, Mauchly became a graduate-level physics student. Unfortunately, Mauchly's father died on Christmas Eve, 1928. He was able to remain at the university on scholarship, however, and he was awarded his doctorate in 1932. He eventually began teaching physics at Ursinus College near Philadelphia, PA. Ursinus College was a small institution and couldn't afford the kind of laboratory that Mauchly wanted to be able to do his research. During his research, he came across an abundance of worldwide meteorological data. The data was easily obtained, but analyzing it was another problem altogether (later, the UNIVAC would be applied to weather forecasts). Mauchly began to think about better ways to perform the calculations for the analysis, both from his own perspective and research as well as for his students. This naturally led him into calculating machines, beginning with a used Marchant calculator. In 1936, Mauchly took a job as a temporary assistant physicist and computer at the Carnegie Institute's Department of Terrestrial Magnetism, working for his father's old supervisor. Faithful computer science history buffs will catch the "computer" in his job title and realize that "computer" in this sense just means a person who does long tedious calculations. During this time, he attempted to get an article published, but it was rejected for not analyzing a large enough set of data. This set him off on ways to easily perform greater volumes of computation. His first thought was to outsource, and he attempted to use students as human computers. At the same time, he also sought an automated solution using tabulating machines. Mauchly's interest in tabulating machines led him to the University of Pennsylvania's Moore School of Electrical Engineering in 1941. The Moore School was working with the U.S. Army to train engineers to work weapons and communication systems for the military due to World War II. Mauchly joined up and studied electrical engineering at the school. During his time there, he met John Presper Eckert, who would become his historically famous collaborator. The Moore School had a device called the differential analyzer. It was an analog computer that solved differential equations by integration. The U.S. Army had the school use the device to compute artillery shell trajectories. 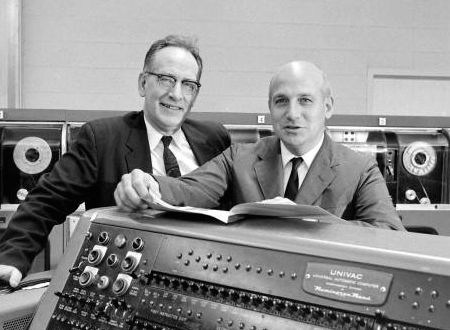 Both Mauchly and Eckert were very involved in the project and it was this project that eventually led them to create ENIAC (Electronic Numerical Integrator and Computer), the first electronic general-purpose computer. ENIAC was Turing-complete, digital, and programmable to solve a wide array of problems. In 1947, the duo left the Moore school and founded the Eckert and Mauchly Computer Corporation (EMCC), the first computer company. At EMCC, their first product was called BINAC (BINary Automated Computer). At EMCC, Mauchly was responsible for the programming and applications for the production hardware. After meeting with many individuals who were interested in using computers to crush (note from Matthew: I think Pete meant "crunch", but I love the idea of "crushing" numbers, so I left this in) numbers for them, he sought out to make the software that they'd need to do their jobs. Because of this, EMCC began to hire coders. Mauchly's experience with ENIAC led him to create "Short Code" (more on Short Code available in a paper called "The UNIVAC Short Code"), which was the first programming language actually used on a computer. Konrad Zuse's Plankalkül language was envisioned first, but remained unimplemented for 50 more years. Mauchly put his money where his mouth was about the importance of applications, too. His software mindset led to him hiring Grace Hopper to develop a compiler for the UNIVAC computer. After Rand, Mauchly formed his own successful consulting companies, Mauchly Associates and Dynatrend. He retired to Pennsylvania and died on January 8, 1980. Mauchly's legacy is certain. He was a founding member and president of the Association for Computing Machinery (ACM) and also helped found the Society for Industrial and Applied Mathematics (SIAM), serving as its fourth president. He was a was a life member of the Franklin Institute, a Fellow of the IRE, and a Fellow of the American Statistical Association. He received several honorary degrees as well as the Scott Medal, the Goode Medal, the Howard N. Potts medal, the Pennsylvania Award, the Emanual R. Piore Aware, and many others. Konrad Zuse (zoo-sah) was born in 1910 in Berlin, Germany. Some of you may be looking at that city and date and already saying "uh oh". Well, you didn't think it was just the allies making advances in computing, did you? Zuse's father, Emil Zuse, was a postal worker, and in 1912, they moved to Braunsberg, East Prussia, which became Braniewo, Poland after World War 2. In college, Zuse studied engineering and architecture, eventually settling on civil engineering (there is some speculation that the film Metropolis influenced Zuse to pursue civil engineering). After getting his degree, Zuse worked at an aircraft factory, where there were a lot of calculations that had to be made by hand. Zuse found these tedious (sound familiar? ), so he thought about how much better it would to get a machine to do this work. He created a computer in his parents' basement in 1936 called the Z1. It was programmable, used boolean logic, and read programs off tape. It was destroyed in the bombings of Berlin in 1943 along with the plans. However, in 1986-1989 Zuse rebuilt a Z1, which is now on display at the German Museum of Technology. Skip ahead to the 20 minute mark on this video, an episode of the The Machine That Changed the World, for some brief soundbytes with Konrad Zuse. Zuse was drafted into the infrantry during the war, but persuaded the military to let him build a computer instead. Zuse worked in relative isolation from other major computing advances at the time. He even claims that he had never heard of Charles Babbage. The Nazis funded his work on the Z2 computer and then the Z3, which were electro-mechanical in nature. They also funded the S1 and S2 machines, which were not general purpose computers--they were designed for aerodynamic calculations of glide bombs. Zuse stared work on the Z4, privately, from 1942-1945. In February 1945, the unfinished Z4 was moved so that the Soviets would not get to it. It was later developed into a finished product, and sold to a university in Zurich, to be used until 1959. Zuse formed a company and delivered 251 computers by 1967. It was while working on the Z4 that Zuse decided that the low level machine language was too difficult to write complex programs in. So he created a programming language called Plankalkül (the next time you get any ideas about how your favorite language is the best, maybe you should consider how many umlauts it has). This language did not get much attention, but he wrote a book about it and a compiler for it was eventually created in 1998. Zuse's company was eventually purchased by Siemens, and Zuse retired, though he continued writing, applying for patents, etc. Zuse wrote a book, Calculating Space, that suggests that the universe is one giant computation, which pioneered the idea of digital physics. Zuse died in December, 1995, 85 years old. Konrad's son, Horst Zuse, was born in 1945, and is currently a professor of CS at the Technical University of Berlin. My intention was to create these brief bio posts in chronological order (by each person's birthday). I knew that would never really work, because I was bound to discover some other important figures not on my initial attempt at a list, as is the case this time. While writing about Grace Hopper, I discovered that Howard Aiken is worth writing about too. Howard Aiken was born in 1900 in Hoboken, New Jersey. His father was Daniel H. Aiken, who came from a wealthy Indiana family. The Aiken family moved back to Indiana, where Howard was raised as an only child. Daniel Aiken was an abusive alcoholic, and by the age of 12, Howard drove his father out of the house with a fire poker, and he was never seen again. When Howard reached the 9th grade, he left school to install telephones to help support his mother. One of his teachers, recognizing his math skills, arranged for him to get a night job (as an electrician's helper), so he could still attend school. "The desire to economize time and mental effort in arithmetical computations, and to eliminate human liability to error is probably as old as the science of arithmetic itself." Eventually, IBM agreed to fund the proposal, and Aiken started working on the ASCC (later called Mark I) in 1939. It was moved to Harvard in March 1944. (Grace Hopper joined the team at Harvard in July 1944). In August 1944, John von Neumann went to Harvard to run some imploding simulations used for research in creating the first atomic bomb. It's quite breathtaking to think about this event: two tremendous forefathers of the world of computing, collaborating with huge, imposing machines to try and effect one of the most important global conflicts of all time. As I explore more of the figures of computational crossroads like Los Alamos, Bletchley Park, and Palo Alto, I'm sure this will be a continuing and compelling theme. The Harvard architecture was born out of the Mark I. It stands in constrast to the Von Neumann Architecture, in that the program is stored separately from the memory. The Harvard architecture was born out of technical constraints, but it lives on in the Modified Harvard architecture. These architectural concepts are still with us today in operating systems, virtual machines, and programming languages. During World War 2, the Mark I was starting to get a sizeable backlog, so the Navy commissioned a second machine from Aiken, the Mark II, which also used the Harvard architecture. The next computers from Aiken, the Mark III (which was actually featured on the cover of Time magazine in 1950) and Mark IV were built with solid-state components instead of relays. For more on Aiken, check out Howard Aiken: Portrait of a Computer Pioneer, which seems to be available for free on Google Books. This biography will be the first one to really challenge the "brief" label. That's because this subject--the Michael Jordan of computer programming--lived such a long life and accomplished so much in computing that it's hard to be brief when discussing all of her accomplishments. Grace Brewster Murray was born in 1906 in New York City. From an early age, she displayed a hacker's curiousity, dismantling alarm clocks at an alarming rate to figure out how they worked. She applied to Vassar College at age 16, but they didn't let her in until the next year. By 1934, she had a Ph.D. from Yale, and she became an associate professor at Vassar by age 35 (in 1941). And then, of course, World War 2. Hopper took a leave of absense in 1943, and volunteered for the Navy Reserve. She graduated first in her class at a midshipmen's school in Massachusetts, and was assigned to work on the Mark I computer at Harvard. The Mark I was a mechanical computer, using relays, switches, and so on. It was designed by Howard Aiken, who drew inspriation from Charles Babbage's analytical engine, but we'll talk about Aiken in another post. From 1930 to 1945, she was married to Vincent Foster Hopper, and she retained his last name after their divorce. Grace Hopper stayed at Harvard to work in the computation lab until 1949. She joined the UNIVAC team at EMCC (later part of Remington Rand) as a mathematician. In 1952, she documented a literal bug in the system, which lead to today's common use of the term "bug". She pasted this moth into the log books. In 1952, she had created the first compiler, which was called "A", the first version of which was called A-0. "Nobody believed that. I had a running compiler and nobody would touch it. They told me computers could only do arithmetic." In 1954, Hopper became the director of automatic programming at Remington Rand (the first to hold that title), and her department was responsible for creating MATH-MATIC and FLOW-MATIC [PDF], two compiler-based programming languages. In 1959, at a 2-day conference, Hopper was a technical consultant to a committee that defined the COBOL programming language, which largely built on the FLOW-MATIC language. She went on to serve in the Navy as a director of systems planning, developing COBOL software and tools to be used by the entire Navy. In 1966, she retired according to Navy regulations. She was recalled in 1967, but then again retired in 1971. She was recalled again in 1972. During this last stint, she was promoted to commodore (a position which was eventually renamed to "rear admiral"). She once again retired in 1986. She was then hired by DEC, where her role was mainly promotional: speaking, lecturing, and so on. She worked for them until her death in 1992, and she is buried in Arlington National Cemetary. The USS Hopper, a U.S. Navy Destroyer that's still in commission, is named after her. The ACM has an annual Grace Murray Hopper Award for Outstanding Young Computer Professionals. Notable recipients: Donald Knuth, Richard Stallman, Bjarne Stroustrup, all of whom will probably be covered by this series at some point. There is an employee group at Microsoft called the "Hoppers". She received 40 honorary degrees from universities during her lifetime. FORTY. She also appeared on the David Letterman show, in which she uses one of her well-known illustrations about nanoseconds. Tommy Flowers was born in London in 1905. He was the son of bricklayer (not a banker). While working as a mechanical engineer's apprentice, he tooks night classes to get an EE degree. It's interesting to compare his father's profession with others in this series. Sons of bankers seem to very math and theory oriented, while Tommy Flowers seems to be more mechanically and hands-on oriented. There's plenty of overlap, and all are brilliant, of course. From 1935 on, Tommy Flowers seemed to be most focused on phone exchanges, and was interested in making them completely electronic. Were it not for the start of World War II, Flowers might have devoted his entire career to phone exchanges. In 1941, Alan Turing (whom I will definitely get to later), working at the famed Bletchley Park, asked for Tommy Flowers to build a decoder for the Bombe. This decoder wasn't ever completed, but this was the start of a professional relationship between Flowers, Turing, and the best code-breakers in England. One of the codebreaking devices created at Bletchley Park was the Heath Robinson. Tommy Flowers built the "combining unit" for this machine. This module used vacuum tubes (the British call them "valves") to implement boolean XOR logic. This may sound trivial now, but the use of vacuum tubes was a key innovation here that Tommy Flowers would later apply to the Colossus. Vacuum tubes are all but obsolete these days--mainly replaced by the transistor for most applications. The "T" in "CRT" stands for tube, so maybe you have a few of those still around. Traditional light bulbs are also vacuum tubes. Here's a video on the many applications of vacuum tubes. In particular note, at 7:10, it talks about how tubes are used for amplification. If you then move ahead to 13:14, you'll see that the same grid used for amplication can also be used for control: closing, opening, or modifying a circuit (closing and opening being useful for logic, but computers aren't mentioned in this video). Flowers is most famous for the design and creation of Colussus, which is often considered to be the first electronic, programmable computer. It was used for code breaking, and especially key in the Normandy invasion. This machine used around 2000 vacuum tubes, which is over 10 times as many as other electronics (like RADAR) used and put reliability into doubt: they often broke and/or just wore out. That's a headache when you depend on a handful of tubes; it's debilitating with thousands. However, Flowers previous work with vacuum tubes caused him to believe that keeping the tubes running continuously was key to improving their reliability. There are a lot of videos and information out there about Colossus, so I thought I'd link to a few that I found particularly interesting. A short film created by Google that focuses on the people who built Colossus and it's ultimate, unfortunate fate. A rebuild of Colossus at the Bletchley Park museum - part 1, and part 2. Lots of information about how the machine works and how it's operated. After the war, Flowers went back to work on phone systems at the Post Office Research Station, where he continued to advance electronic phone exchanges. He retired in 1969, and he published a book on telephone exchanges in the early 70s. It wasn't until the 1970s that Flowers's work on Colussus was able to be made public. Until then it was a closely guarded secret that Flowers couldn't even tell his family about. They just knew it was important, top secret work. Flowers went on to write about Colossus in The Design of Colossus. He started receiving general recognition for his accomplishments, and received many awards and honors. He died in 1998 at age 92.